In reality, business plans can take a long time to write, require that you have a tremendous amount of data at your fingertips, depend in part on projections and often are responsible for creating a long list of research you still need to conduct and other work you need to complete. Plus, not everyone is sold on the usefulness of a business plan. Consider the study of 116 new businesses conducted by Babson College. The study found that the presence of a formal business plan before starting a small business made no difference in the ultimate success of the business, assuming it was one that was not seeking outside funding. Some also argue that taking the time required to create a business plan can stifle the startup process and cost precious opportunities for a small business. On the other hand, one study found that entrepreneurs who write formal plans are 16% more likely to achieve viability than the otherwise identical non-planning entrepreneurs. Other studies have shown that while completing a business plan is not a guarantee of success, it does indicate that the type of entrepreneur who completes a business plan is also more likely to run a successful business. So why not arm yourself with one of the best tools a small business owner can have? If you're still on the fence, consider these five reasons you should write a business plan before doing anything else in your small business. If you plan to approach a financial institution for a loan, apply for a small business grant, pitch your business idea to investors, or enlist the support of a business partner, a business plan is required. Potential investors and supporters want to see the true potential of your business idea clearly laid out in hard facts and numbers. A business plan is the best, and generally, the only acceptable way to provide this information. There are some sections in a traditional business plan that you simply cannot complete if you are on the fence, undecided, or not fully committed to a certain point. Business plans help you eliminate the gray area because you have to write specific information down in black and white. Making tough decisions is often one of the hardest and most useful parts of writing a business plan. For example, if you have not decided on exactly what products you will sell at what price points, it will be very difficult for you to complete the Products and Services Section of your business plan. Identifying this and other vital information is a valuable end product of the business planning process. 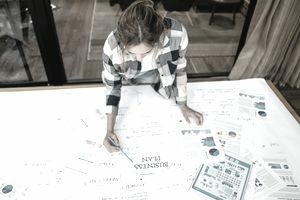 Writing a business plan is often the first real struggle for the small business owner who wants to launch a new venture, but doesn't want to consider that his or her business idea may be a bit flawed or is not yet fully developed. While this is an unwelcome and terrifying thought for an impassioned entrepreneur, identifying gaps early on in the process gives business owners a chance to shore up their research, test their ideas and take steps to make the business stronger and more viable. This may initially be a step back, but any and all further work can bolster the entrepreneur's chance of success before he or she invests time and money in a business that is likely to fail. Discovering new ideas, different approaches and fresh perspectives are some of the best things that can happen from the depths of the business planning process. Despite the sometimes negative reputation, a business plan isn't just a long, stiff and structured document. In fact, an effective business plan is the opposite; it's a flexible, growing and dynamic tool that can help you think creatively and come up with new solutions for some of your toughest business challenges. This is especially true when you consider the Marketing Strategy Section. Here, as you create a blueprint for your marketing activities, creativity and fresh ideas are invaluable. Keep in mind that if you are using your plan as a true business planning tool, you don't have to wait until you have all of the answers to get started. You can create an outline of your plan now, filling in all of the information you have at this point, and then work on the blanks as you learn more about the market. This type of fluid and flexible document can be invaluable to a new business. For more on business plans, review this business plan outline. Then, for a quick and painless start to the business planning process, try this simple business plan template.